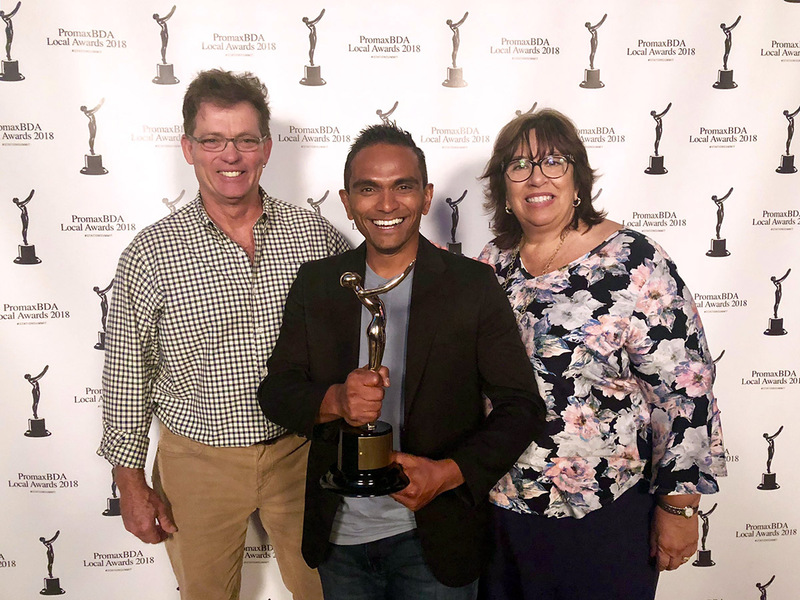 The team at Devlin Design Group has won a PromaxBDA Local Gold Award for the fifth year in a row, this time for work with Hearst’s WESH in Orlando. “We are thrilled to share this prestigious PromaxBDA gold award with the team at WESH. Collaboration was the key ingredient to this set’s success,” said Kartik Dakshinamoorthy of DDG. 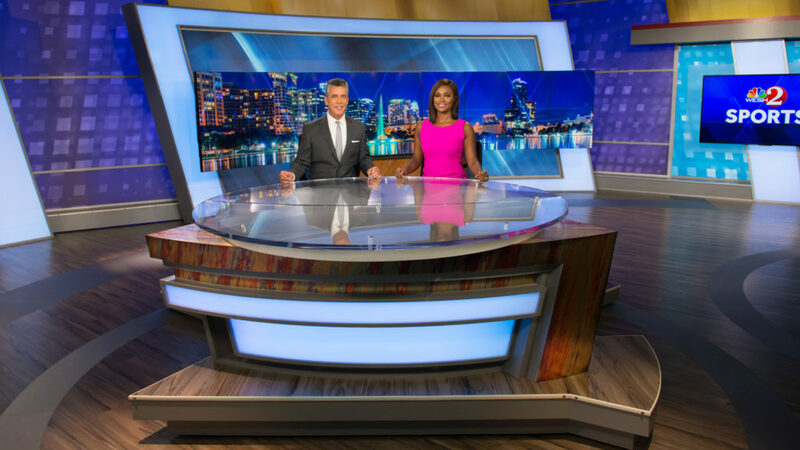 Even though the award-winning design is a high tech storytelling environment, the team at WESH wanted the overall feel to be warm and inviting, notes DDG. The inspiration for the weathered wood floor can be seen along the boardwalks of the coastal areas. The tones in the blue, orange and golden graphics surrounding the set can be witnessed in the sea and sky surrounding central Florida. The curving main and weather desks are a contrast to the angular set elements. A weather center designed for breaking weather is situated in the center of the set. The station deals with intense weather – frequent severe summer storms and hurricanes. The 5 person weather team needed a layout to accommodate the group of meteorologists with immediate access to technology, and different venues to visually explain the impending threat to their audience. 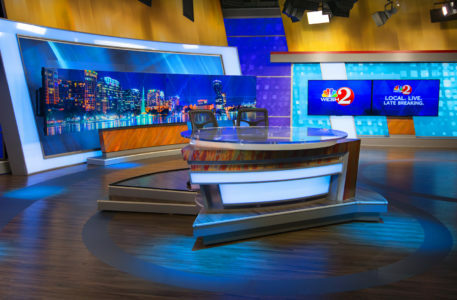 Part of the design includes a separate room where viewers can see the behind the scenes action of breaking weather and news gathering. 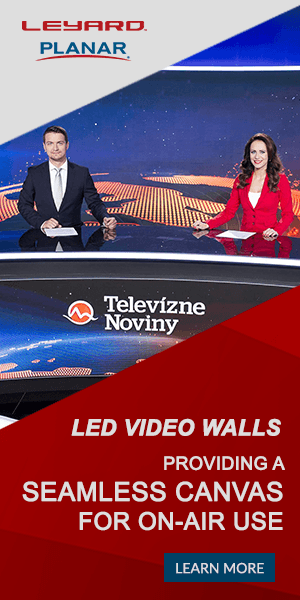 The limitless venues keep the anchors and reporters engaged and upbeat. Versatility is the key word when describing the multiple stages. A 1×9 storytelling array is a dramatic backdrop for the main desk talent shots, the big story, and the interview area which includes a curved couch, perfect for conversation. A 3×3 array of 55-inch monitors anchor the impressive weather center. Four 50” monitors ring the breaking weather room. A 1×3 portrait format array is available for more intimate storytelling. Two 80” monitors for breaking news complete the storytelling environment. RGB LED backlit set pieces add another layer of flexibility. The set design also recently won an Emmy Award.